Oil on panel, 42 x 30 cm. During his stay in Italy in the mid-1830s, Rørbye spent a few weeks in Cervara east of Rome in the end of October. Here, he painted several oil and pencil sketches, where he used the local population as models, including this young girl who prays kneeling in a sparsely furnished room. She is finely dressed with a newly starched cape, a white embroidered shawl and a beautiful red bead necklace. 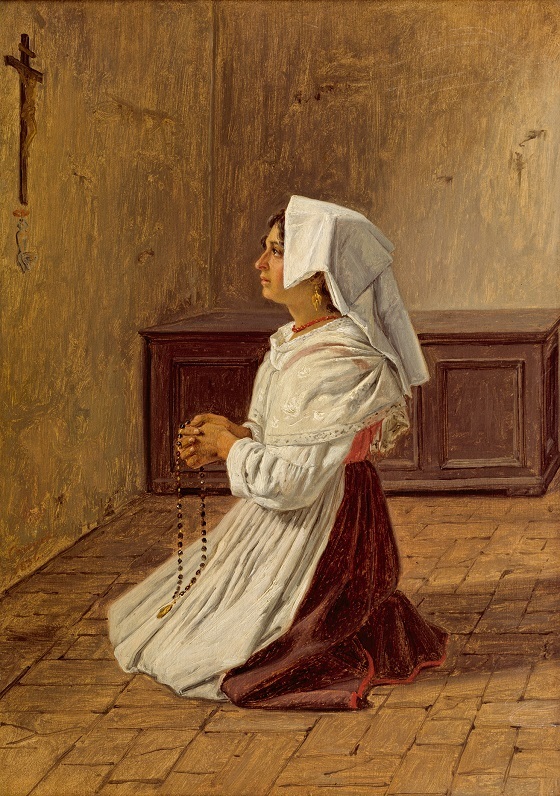 In her folded hands, she holds a rosary, which emphasises her piety. Rørbye has placed her centrally in the image in a tight triangular composition that was probably a conscious choice to tone down the somewhat saccharine quality of the subject with a harmonious and more stringent painterly style.